The Funeral Mass for the late Thelma Paula Richardson will be celebrated in the Church of Saints John and Paul Willetton Catholic Parish, Pine Tree Gully Road, Willetton commencing at 10.30am on WEDNESDAY (10.4.2019). 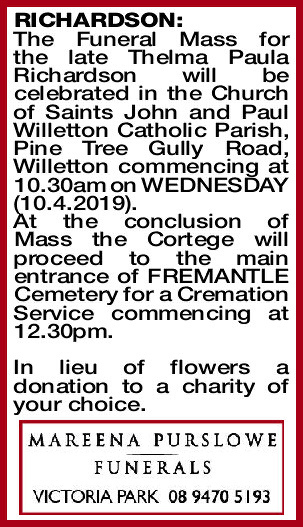 At the conclusion of Mass the Cortege will proceed to the main entrance of FREMANTLE Cemetery for a Cremation Service commencing at 12.30pm. In lieu of flowers a donation to a charity of your choice.